As reported last week, the Hubble Space Telescope is 20 years old this year and, during this period, this amazing feat of engineering has provided hundred of mesmerising images of deep space. So, if you have an iPhone or iPod Touch and you would like to find out more about Hubble and the universe, this app is for you. 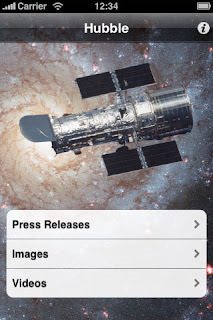 The brilliant Hubble App features every Hubble Space Telescope news release and its supporting materials, designed to further your knowledge of astronomy. It consists of news release texts, pictures, animations and video clips on topics ranging from dark matter, supernovas, planetary nebulas, views of the galactic core and browns dwarfs. There is also a "shake for fact" feature, which is brilliant fun. To view in iTunes or to download this excellent app, click here.